Welcome to T.Allen Marine Construction, Maryland’s leading provider for waterfront design and construction. We are licensed contractors and are fully insured for water born contracting. We are a successful company built on hard work and customer satisfaction. Having our own employees on your property ensures you full protection and gives you the peace of mind that we are involved every step of the way. 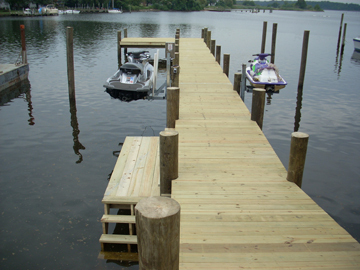 At T.Allen Marine Construction we construct high quality docks, piers, bulkheads, Rip-Rap revetment and boat lifts for both residential and commercial projects. We have the experience and the equipment needed for your foundation and pile driving projects. Give us a call today to get started on your waterfront project! Need Archetectural or Interior Design Photography? Try Mitch Allen Photography!